In the early 1900s, the painter Tom Roberts was the first to propose that Australia should have a national portrait gallery, but it wasn’t until the 1990s that the possibility began to take shape. The 1992 exhibition Uncommon Australians - developed by the Gallery’s founding patrons, Gordon and Marilyn Darling - was shown in Canberra and toured to four state galleries, igniting the idea of a national portrait gallery. In 1994, under the management of the National Library of Australia, the Gallery’s first exhibition was launched in Old Parliament House. It was a further four years before the appointment of Andrew Sayers as Director signalled the establishment of the National Portrait Gallery as an institution in its own right, with a board, a budget and a brief to develop a collection of portraits reflecting the breadth and energy of Australian culture and endeavour. The opening of displays in the refurbished Parliamentary Library and two adjacent wings of Old Parliament House in 1999 endorsed the Gallery’s status and arrival as an independent institution. While the spaces of Old Parliament House proved adaptable to the National Portrait Gallery’s programs, its growing profile and collection necessitated the move to a dedicated building. 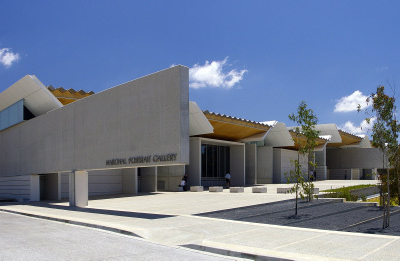 Funding for the $87 million building was provided in the 2005 Federal Budget and Sydney-based architectural firm Johnson Pilton Walker was awarded the job of creating the gallery, with construction commencing in December 2006. The new National Portrait Gallery opened to the public on 4 December 2008. 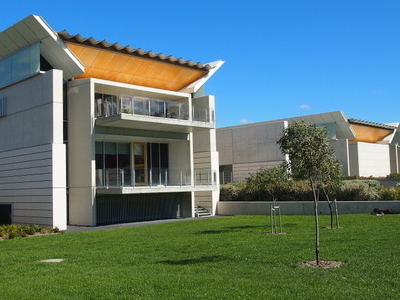 Here's the our members favorite photos of "Galleries in Canberra". Upload your photo of National Portrait Gallery!